The Executive Producer of The Lord of the Rings has joined forces with the creators and producers of The Amazing Race to conjure a land of magic and malevolence, where mythical creatures lurk in the woods. For 12 lucky souls, a fantastic world will come alive in a unique competition series where players will engage in epic challenges. I thought this sounded awesome. KPD thought it sounded like watching other people LARPing. But he was willing to give it a try, just to see what it was. One episode in, we were both obsessed. I think we watched two or three episodes before the Kid got home from camp. Since then, we’ve watched through episode 6, and we’re bingeing away and loving every minute. When I started this post, I felt a little off-topic because the Kid had refused to watch until today. But I put the computer aside when KPD cam in to watch more, and a few minutes later, the Kid emerged from her room, where she had figured out how to put USA Swimming logos on her nails (so cool!) She plunked herself down on a chair in the living room and started asking questions. Now she, too, is hooked. I am, like many people, susceptible to reality show manipulation. It’s not my favorite thing, as I generally prefer scripted shows or flat-out game shows. But of course these shows are made to be addictive, and they are. But this one has captured us more than previous shows. I think it’s because of two elements. Unlike most reality shows, this one has a plot. Twelve heroes are competing to prove which one is the True Hero who will save Everealm from the evil Verlox. The plot moves forward with each episode and, while it tends to unfold in the predictable rhythm we expect from reality shows (group challenge, individual challenge, voting off, celebration, crisis) it does move forward. One is interested, at the end of each episode, to find out what will happen next. And the written characters are fun, too. It’s fun to see what they will do, and it’s also fun because I’m sure they have written characters, but they have to improvise quite a lot as they interact with the competitors, and I know that’s a lot of fun for actors. These twelve people all love fantasy of one kind or another. Comic books, role playing games, renaissance faires–whatever. Each of them loves something in the genre. And so watching them enjoy living in a castle and using the weapons and instruments they get to use on the show is delightful. As KPD says, this is the first reality show that it seems might be fun to be on. In any case, I’m now completely invested, to the point that when that one guy I hated was sent home, I couldn’t believe how happy I was. So my question is, why didn’t I know that this was a thing? Sure, i don’t watch regular TV, but why weren’t all my geeky friends watching this? Did ABC completely fail? What happened? Because this show is binge-watching heaven. In the Netherlands, I am told, it is customary to congratulate a person’s parents at a birthday party. After all, it’s the anniversary of a happy occasion: the day they became parents. Unless, of course, their child was adopted on a different day. But that doesn’t mean I can ignore the other day. June 17th doesn’t mean much to the Kid, but for me and KPD, it’s the anniversary of one of the happiest days of our lives. I can remember the anxiety of court, and I remember also floating through the day, not sure where to put my feelings until we got all the paperwork done and I could go to the International Call Center and call my mom. Before Kid came home, I read a lot of books written by adult adoptees and experts on adoption. The consensus opinion was that there’s nothing wrong with celebrating Adoption Day (known in other families by various names such as Gotcha Day, Airplane Day, or Family Day) but that it should always hold a second place status to the adopted child’s birthday. That was okay with me. After all, an adoption anniversary is more like a wedding anniversary, really. Our wedding anniversary celebrates the day KPD and I became a family, and Adoption Day celebrates the day Kid joined the family. I didn’t want to have big parties to celebrate Adoption Day, I just wanted to acknowledge it each year within my own family. And to do this, I wanted a tradition. It should be something to do with food, to mirror birthday cake. And ideally, it would be an appropriate symbol that would encompass various ideas to do with adoption: the fact of two families blending together, the mixed feelings some adoptees have when they contemplate the fact of their adoptions, and the fact that our bond is forever. At first I thought a black and white cookie might be good, but I don’t like black and white cookies particularly, and the division between the black and white seemed too stark. Then it hit me: vanilla fudge swirl ice cream! It was perfect. Dark and light to symbolize the feelings, sweet for the celebration, and although you can clearly see the chocolate and vanilla, they are inseparable, just as our family is now an indivisible unit. But here’s the thing. Neapolitan isn’t just a substitute for vanilla fudge twirl. In the end, I think it’s better. After all, there are three people in our family, not two. We could, technically, be divided. However, never cleanly. Some of the Kid’s strawberry has mixed in with my chocolate and will never come off, no matter what happens. And while we still function as individuals just fine, we’re best all together. So I think next year we might celebrate with Neapolitan ice cream again. One thing is sure, though. We will celebrate. Because the day you became a parent isn’t something you can forget. It was kind of odd, because we have a Wii, and we never play it at home. But at my parents’ house, the Kid loves to play. So we did. And even though she wasn’t always generous about giving me a turn, and she plays ping pong like it’s a shooting game, and we were playing a seven year old game on an out of date gaming system, there’s something about your tween inviting you to do something with her, and then having fun doing it together, that’s just awesome. And any day where you make up a new happy dance is a successful day in my book. What do you do when you have nothing to read? The other night I found myself unexpectedly with nothing to read. I hadn’t been paying attention, and when bedtime arrived, I realized that I had finished the book I was reading the night before. My first plan of action was to ask the Kid to borrow something. The last time I did that, I wound up reading The Fault in Our Stars, and I’m not sorry I did. But Kid had just gone to bed herself and wasn’t in the mood to find me something, and I didn’t want to turn on her light to peruse her shelves. 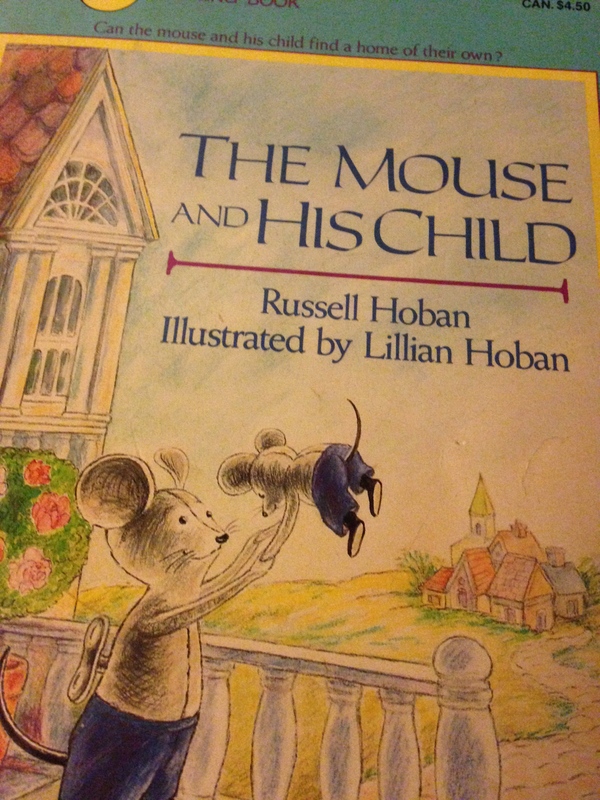 So I shrugged, went to my own shelf, and pulled out The Mouse and His Child, by Russell Hoban. I’m not sure how many times I’ve read this book. The first time was in high school. My brother found it at a used bookstore and brought it with him to a family vacation on Martha’s Vineyard. We were sharing a house with another family who had a younger child (I think he was around eight at the time) and since Brother recommended the book, my mother decided she’d read it aloud to our young friend. She read to him on the living room couch in our rental house, which was a big summer house with a great room. Around chapter three, the youngster decided that the book was too violent for him and asked if she’d stop. (Chapter three is about territory, and a lot of animals die, mostly to feed other animals.) But by then, the rest of us were hooked. So mom read the rest of the book aloud to all the adults (and teenagers) in the house. Why times how equals what. Which is freaking brilliant. Solve for X and you have the answer to any problem you might come across. I think I might add that quote to my list of cross stitch projects, so I can hang it on the wall in my office. Some books you can just read again and again forever. Sadly, this one is out of print, but if you can find a copy (preferably with the original Lillian Hoban illustrations) you should pick it up. You can learn a lot about the world from a children’s book.